You are here: Home / Articles / Does This Bomb Cross Your Boundary? My novel – The Innocent’s Story – is a dangerous book. (This article written on first publication of Innocent’s Story 2005) I didn’t know that when I wrote it. I thought it was a serious and moral attempt to contextualise terrorism for children. If the idea of talking to children about suicide bombing makes you want to turn the page, you’re not the only one. When they received the manuscript of The Innocent’s Story, my American publishers set about cancelling my contracts with immediate effect. So much for the Land of the Free. I thought things might be different here, not least because I had a good track record: my first book for children Feather Boy won the Blue Peter Book of the Year Award, was made into a TV series which won a BAFTA for Best Drama and is currently published in 18 countries. Wrong again. The British publisher, having said initially that the book was ‘interesting, intelligent, provocative and important’, declared, six months later, that it didn’t work and asked me to lay it aside. 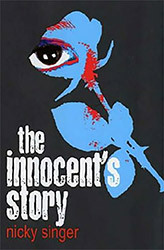 But I couldn’t because, more perhaps than any other book I’ve written, The Innocent’s Story represents everything I believe in: open-mindedness, robust no-holds-barred debate and, yes, pushing at boundaries. The most obvious line I crossed was the ‘wanting to open a discussion with children’ one. Although, with suitable innocence of my own, I have to say it wasn’t so obvious to me. My father died when I was a scant fourteen and that’s when my mother began to treat me as an adult. I’ve replicated that in my relations with my own children and talking openly about challenging subjects is one of the delights of my family life. But the wider world, apparently, doesn’t see things this way. The gatekeepers are very nervous about what is said to children. But there’s a schizophrenia here: as parents, or even simply as decent-minded adults, we like to think we can protect our children from some of the worst horrors of the modern world, but actually they are exposed all the time. When our media culture beams the horror into our living rooms it also, willy nilly, beams it in to our children’s lives. There will be no child on earth with access to a television who did not see pictures of the twin towers falling; no child in London unaware of the July bombing. What do they do with this knowledge, who speaks to them about it, how does it affect them? The least our children deserve, I believe, is a context for the events they witness around them. If we say nothing about the bombs to our young people it gives terror a kind of legitimacy, makes it ordinary, not something worthy enough to be remarked upon. The usefulness of fiction in this process is that it can offer a ‘safe space’ for that discussion. Terrible events can be realistic but not real. Love and morality can sit alongside difficulty and grief. And the experience of a book and the issues it raises can also be shared at school, or among a peer group. So what’s my scary story about? Well it opens (bear in mind I finished this book over 18 months ago) with a suicide bomb going off in a London train station. The narrator of the story is a 13 year old child killed in the explosion. She becomes a ‘para-spirit’, only able to survive if she holes up inside a living human’s head. As luck and fiction would have it, she ends up in the head a bomber, because that’s what the book is, an attempt to get inside the head of a bomber. Now here’s the next line being crossed: if you try to get inside the head of a terrorist, you can be accused of sympathising with terrorists, as the Lib-Dem MP Dr. Jenny Tonge was when she made her remarks about the Palestinians. But, for me, there is a world of difference between sympathy, where you agree a person’s premise, and empathy where you attempt, for a moment, to stand in that person’s shoes and wonder whether, if you’d walked their path, you’d have ended up where they ended up. If, as nations and people, we lose our grip on empathy, then we are lost indeed. And people includes kids. Next frightening line: religion. All sides of the religious divide currently appear to wish to legislate – sometimes violently – about what can and can’t be said artistically about their faith; witness Sikh outrage at the Birmingham Rep production of Behzti, or Christian Voice’s attacks on Jerry Springer the Opera. My research on suicide bombers turned up two basic types, the politically motivated who use religion as a fig-leaf and the genuinely religiously motivated. I didn’t see how I could write a book about the inside of a suicide bomber’s head without inquiring into the role of religion. I didn’t want my readers bringing any baggage to the religion I chose but it seemed disingenuous to settle upon a radical sect of Icelandic Quakers. I decided to make up my own religion. I needed something close enough to the truth to feel real, but far enough away from reality not to demonise or offend. Enter the T’lanni religion with its radical Haliki sect. The gatekeepers said it was thinly disguised version of Islam. But – despite a millennia of religious conflict which would have you believe otherwise – all religions are to some extent thinly disguised versions of each other. Take for example Christianity, Judaism, Islam, they all have their single deity (whether it be God or Allah) their Holy book (whether it be the Bible, the Torah, the Koran), their principle witness (Christ or Abraham or Muhammad). I used this basic structure: My god is J’lal, my book the Holy Desert Scrolls, my witness the angel Ingali. Now here’s a thing the grown-ups don’t get: children do not think like them. When I gave the manuscript to my eat-books-for-breakfast 12 year old friend Hannah, she said: ‘It’s brilliant – except, well, I’ve never heard of the T’lanni religion and we do Comparative Religion at school.’ Game on. The other advantage of an invented religion is that you can draw parallels. My religion has an equivalent of ‘jihad’ but only to make it clear that, far from being exclusively associated with ‘holy war’ (which you would think by reading the western press) the predominant meaning of ‘jihad’ in the Koran is the literal Arabic one ‘to strive hard’ and it’s used, for instance, to mean the attempt to get closer to god by overcoming bad desires. I didn’t know that before I began my research. I wonder if you did. On a lighter note, the gatekeepers had a problem with the book’s humour. If it’s about a serious subject then it should be serious, they intoned. I mentioned, only a tad defensively, that the gravediggers’ scene in Hamlet isn’t there because Ophelia’s death doesn’t matter but because human beings can’t bear very much reality. Adult ones anyway. My friend Hannah likes a good laugh. Finally, and very seriously, what I aimed for in the book was complexity and that I realise (again rather late in the day) is another line I’ve crossed. Our increasingly complex world is increasingly simply– and inadequately – described. Take, for example, the phrase ‘The War on Terror’. That has no more meaning than a war on ‘shooting’ would. because terror is not the thing, it’s a symptom of the thing. The political useful – but deluding – thing about the term War on Terror is that it lumps everyone together: religious fanatic, Palestinian, Chechen. All of them conveniently characterised as The Other, The Enemy, as in Them and Us, Goodies and Baddies. Disney stuff, ‘kids’ stuff. But these are not the same peoples with the same grievances. If we are going to address their problems – which have become our problems – we need to ask deeper questions. We need, I think, to know what the ‘thing’ is, the driver behind the anger that would bring one human being to believe it is appropriate to blow up another. And you know what? I think the kids may be able to go this place more easily that we can because, as yet, they are the ones with the open minds. I hope my book The Innocent’s Story can contribute to keeping it that way. And I’m very lucky that my new publisher – Oxford University Press – with it’s 527 year tradition of research, education, scholarship and free speech, believes so too.